Thread: Ugly Lakers autograph! Yuck! Wow. This might be one the worst autographs ever! Seriously, that is outrageous, $64.99 and $3 shipping for THAT? NO. 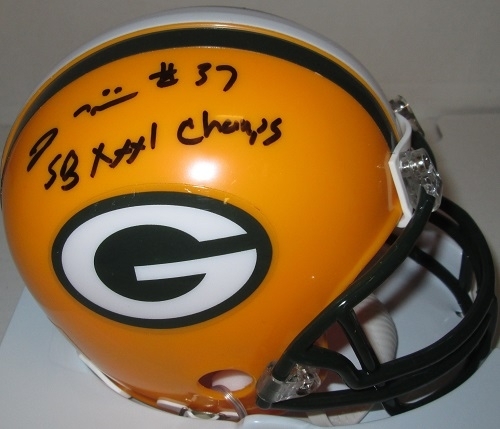 Luke 1:37 "For Nothing Will Be Impossible For God"
you think that one is bad, there is a former packer by the name of Tyrone Williams who has a horrible signature. I didn't find this out until Waukesha sports cards was doing a mystery 8x10 grab bag. you pay 15 bucks and they ship you a random autograph and he happened to be one of the ones I got. I don't have a picture of it downloaded to my computer but, here is an example of his autograph, luckily this mini helmet had an inscription. ^ Ouch. That line with the two dots over it? It looks like an emoji. definitely, when I got the 8x10 in I thought they made a mistake because I couldn't find a signature. then when I looked at it I saw the little squiggles and was like really!?! Sorry for the bum signature but nice to see a shout out for Waukesha!